His time in the Marine Corps toughened him, but did not prepare him for being launched headlong into the side of an SUV. The 40 year old Chicago man suffered a separated shoulder when he collided with the side of a 2007 Ford Explorer while riding along the lake front bicycle path on November 15, 2011. With my law firm's help, the bicyclist's claim against the driver has successfully resolved for a significant sum of money. The collision occurred at around 11:15 a.m. near the 1600 block of North Lake Shore Drive where the bike path is intersected by West LaSalle Drive. When the southbound cyclist approached the short crossing he encountered a large truck parked nearby. Its precise location at the time was a matter of considerable controversy during the case. It was there to repair a malfunctioning light near the intersection. As he approached the area, the bicyclist slowed to pass in front of the truck, which was pointed east toward the lake. Unbeknownst to him, at the same time the Explorer was crossing on the other side of the International 4300 into the area from the adjacent off ramp of North Lake Shore Drive. West LaSalle Drive at that location serves as an entry point for North Avenue Beach's parking lot. With the truck blocking his sight of the off-ramp, the bicyclist was unaware what was happening. When he rounded the truck the SUV suddenly appeared. The bicyclist struck the driver's side of the vehicle, spearing it with his helmeted head and his shoulder. He was taken from the scene by a City of Chicago ambulance to Northwestern Memorial Hospital nearby. The driver of the SUV attempted to lay much of the blame for the crash on the operator the International truck. He claimed that the truck was parked in the middle of the intersection so as to obscure view of bicycle traffic on the path, and that the operator actually waived him through causing the collision. We conducted a thorough investigation of the incident. The driver of the International emphatically denied that her truck was parked in the middle of the intersection. She also denied that she waived the SUV driver through. Further, we took the position that regardless, the SUV driver had a duty to proceed with caution across what he knew, or should have known, was a well used bicycle path. If his view was obscured then there was all the more reason for him to proceed cautiously. He could not transfer his responsibility to someone else. The bicyclist lost consciousness at the crash scene. He was placed on a backboard and in a cervical collar. At the emergency department x-rays were performed on his pelvis and chest, and CT scans were done of his brain and cervical spine. Thankfully, he was wearing a helmet and did not suffer a serious, permanent head injury. However, he sustained a “grade 2 acromioclavicular separation.” After discharge from Northwestern pain in his neck and right shoulder compelled medical follow up at the Lakeside Veterans Administrations Hospital and the Jesse Brown Veterans Administrations Medical Center. (He was on active duty in the U.S. Marine Corps from 1995 to 1999.) At the VA he was noted to experience significant pain in his right shoulder and upper back that was 7 on a 10 scale with motion. He was “having difficulty dressing, driving and lifting things.” This was not surprising given the nature of his injury. A Grade II separation means that the acromioclavicular ligament is completely torn and that the joint is at least partially torn with some displacement. He was prescribed physical therapy which he underwent from mid-November until late December. On December 30, 2011 he was finally able to see an orthopedic surgery consult. At that time he was noted to have a “right shoulder with obvious deformity at AC joint.” However, his healing had plateaued. Presently, he still suffers from periodic pain in his right shoulder which waxes and wanes. His pain increases while wearing a backpack and is impacted by the weather. He continues to take significant doses of Motrin to help abate these flare-ups. The bicyclist is presently enrolled in law school in Valparaiso, Indiana. Getting doored by a careless driver did not slow her down for good. A 66 year old bicyclist, struck by a car door in June, suffered serious injuries, but just a few months after the crash she was back on a bicycle doing what she loved. Now she will also receive monetary compensation, my law firm successfully resolving her case for the full amount of the driver's auto insurance policy. The incident occurred on a pleasant summer day just after 11:00 a.m. The female cyclist was riding her mountain bike eastbound near 1437 West Argyle in Uptown on her way to the dentist. Suddenly the driver of a 2001 Toyota threw his door open, striking the right side of the bike. The impact threw it and its rider across the narrow street and into another parked car. The heavy crash knocked the woman unconscious and snapped her right arm. She was rushed via ambulance to Advocate Illinois Masonic Medical Center, a level I trauma center. A hospital stay was followed by months of painful rehabilitation and a long, hot summer in a confining and uncomfortable cast and arm sling. Independent and athletic, she could not wait to get back in the saddle, even facing the risk of another crash. She told me that she always felt that the risk to her health from a sedentary lifestyle was far greater than the potential harm from another crash. When the cast came off and she regained some range of motion in her limb, she was riding again. She has not completely healed and it is unclear now for how long the effects of her injuries will burden her. However, she has no plans to stop riding. The hastily opened car door affected two Chicago bicyclists in very different ways. For one, the inattentive driver's action inflicted hideous harm. For another, it released inspiration. Thirteen year old Maxine Soss was riding her bicycle with her mother north on Lincoln Avenue in Chicago's Lakeview neighborhood at around 4:00 p.m. on July 10, 2012. As they pedaled passed Lincoln's intersection with West Webster Avenue there was another cyclist riding about 25 feet in front of them. He was 34 years old and riding his daily commute home from work in Lincoln's dedicated bike lane. Maxine saw the car stopped along the curb to the right of the bike lane. She saw the door spring open and slice through the man's lower right leg. She and her mom raced ahead and stopped. The driver was screaming. Blood was pooling. Maxine could see the exposed bones in the man's lower leg. She and her mom helped quell the bleeding and waited with the fallen cyclist for help to arrive. As the weeks passed, the images and sounds of those terrible moments refused to leave Maxine. But the events of that July day did not just leave a dark mark on her memory. They challenged her. They presented a problem in need of a solution; one that she would not just leave to others to solve. What can I do to prevent another person from getting doored? 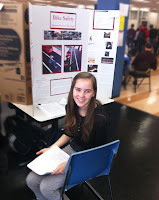 The student science fair at Whitney Young High School presented Maxine with the platform she needed. She decided that her project would be to find an engineering solution to the threat of dooring. She reflected intently on what could be invented to alert a driver that a cyclist was approaching. "After research, meeting with a few physics teachers, and some consultation with a local engineering executive, she came up with an alarm system that could be produced on a small scale, and built a model," said Maxine's mom, Kelly Friedl. Like most good ideas, Maxine's was relatively simple. "By utilizing the general physics principals of a proximity sensor system, she rewired the mechanics of a cordless doorbell system," said Ms. Friedl. "On her scale model, she inserted proximity reader mechanics inside of a toy car. She then attached a proximity sensor (a magnet) to a model bike. As the bike approached the car, an alarm would sound" to alert the driver. In the real world, a small magnetic band would be placed on the bicycle and would communicate with the sensor of a vehicle implementing the system. Maxine and her mom imagine selling the system very cheaply, or even giving it away for free at cycling events, to bicyclists who also drive. The hope is that the bicycling community would help get the project off the ground, creating momentum by using the system on their own vehicles. 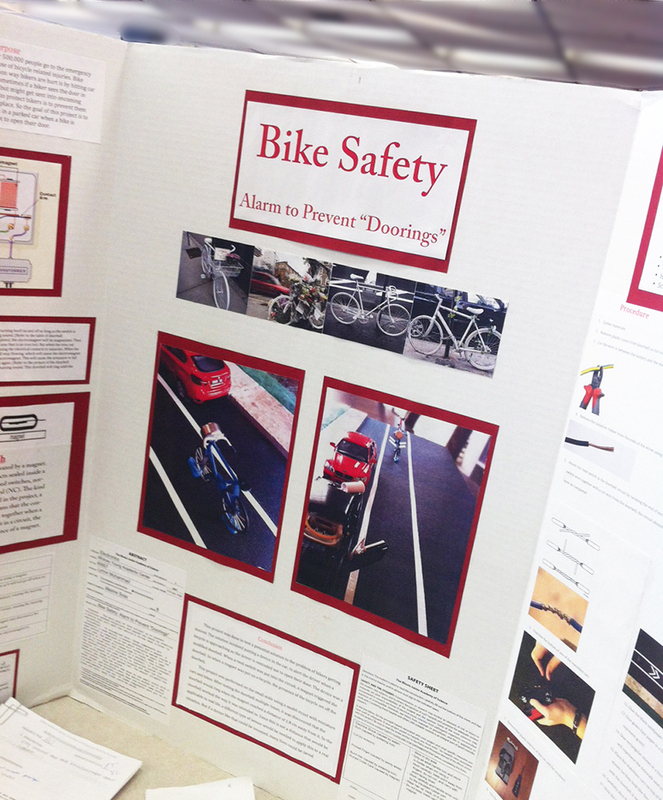 The science fair has come and gone, but Maxine plans to continue her project. She intends to repeat the same project next year, and hopefully start testing it in the real world. Funding is needed to take it to the next level, but her youth and desire to do good fuel a boundless optimism. Maxine can be reached at maxinesoss@gmail.com. Her mom can be reached at kelly@urbaninfant.com. It is the worst case scenario. 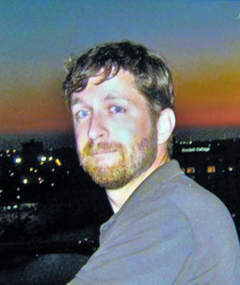 Justin Carver was struck by a truck while riding his bicycle home from work. The crash left him in critical condition with a traumatic brain injury and many broken bones. He "is still in the ICU fighting for his life after surgery to remove part of his skull and relieve the pressure in his brain," according to his wife, Kim. What's more, his young family will continue to be burdened by enormous medical costs from Justin's ongoing care and treatment. The driver that struck him had only minimal insurance coverage. A fund has been set up to accept donations to help pay for what may be a lifetime of medical care for Justin. Please go here to offer your donation: Fund For Justin. The crash occurred on December 3rd at around 5 p.m. at the intersection of 26th and East Avenue in Berwyn, according to The Berwyn News. The truck struck him as the driver attempted to turn "off of East Avenue" while Justin was attempting to cross 26th. Unconscious, he was transported to Loyola University Medical Center. Justin works as an Adult Library Services Assistant at the Stickney-Forest View Library. A co-worker, Allison Mackey, reported on The Chainlink that Justin, "is a safe cyclist and always wears a helmet." Click here to read more about this incident on The Chainlink. Since my holiday shopping plans took me to the Loop today I decided to check out the new Dearborn bike lane for the first time. I secured a video camera to my helmet and rode. (See the video below). I was concerned that riding it on a grey and cloudy Sunday would not provide a "typical" downtown riding experience. Usually, the Loop is deserted on a Sunday. However, today being only nine days until Christmas it was quite busy with both pedestrians and motor vehicles. 4:30 - Four pedestrians are just standing in the lane apparently unaware of where they were. 6:59 - A taxi driver enters the lane and confronts me head on. We have a brief conversation in which he tells me that there is a taxi stand at that location. He is right, but I tell him that he no longer can stop there. He is quite pleasant actually and seemed genuinely confused as to what he was supposed to do. I watch him exit the bike lane. In fairness to him, taxi drivers should receive some instruction regarding relocation of taxi stands in light of the new bike lane. As the video shows there is a great deal of standing water in the bike lane. It rained all day yesterday. Were it colder that water would have of course turned to ice making travel in the bike lane quite dangerous. Certainly the City will need to monitor the situation throughout the winter so the bike lane can be utilized safely. The bottom edge of the car door sliced into the bicyclist, a huge bloody curtain of skin and muscle drawn back revealing the two large bones of his lower right leg. It seemed as if a shaky surgeon cut a large slab from the side of his leg below the knee. Minutes later an ambulance would rush him to the hospital to undergo surgery. Weeks later he would have insult added to injury: The driver that doored him was uninsured. At around 4:00 p.m. on July 10th, a 34 year old male cyclist was doored on his way home from work on North Lincoln Avenue, just north of West Webster Avenue, in Chicago's Lakeview neighborhood. He was pedaling at a leisurely pace in Lincoln Avenue's dedicated bicycle lane when the driver of a 2002 Mitsubishi parked along the curb carelessly open her door just as the cyclist was riding by. The bottom of the door sliced open the man's leg as he passed and caused him to crash hard to the street. Thankfully, he avoided being hit by passing vehicles. The wound to his leg was very serious however. He was rushed via ambulance to Advocate Illinois Masonic Medical Center where he underwent surgery that evening. The bicyclist incurred over $25,000 in medical bills. At first he tried to resolve the matter with the driver himself. However, when he learned that she had let her auto insurance coverage lapse before the crash, he contacted my law firm for help. We immediately notified the bicyclist's own auto insurer that he was injured by an uninsured driver. If an injured bicyclist has his or her own motor vehicle insurance policy, or is covered under another family member's policy, the cyclist may look to the uninsured or underinsured motorist provision of that policy. This is permitted even though the victim was riding a bicycle and the accident did not involve his or her own motor vehicle. Generally, your uninsured or underinsured motorist coverage protects you even when you are injured by a motor vehicle while a bicyclist or pedestrian. Yesterday, after some hard work and diligence we were able to resolve the bicyclist's uninsured motorist claim for the full amount of coverage, $100,000. She was pedaling in the dedicated bicycle lane on Damen Avenue in Bucktown when the door sprang open in front of her. There was nothing she could do to avoid the inevitable. The 27 year old female bicyclist was riding to work southbound on Damen Avenue a few feet north of Cortland Street on August 2nd when the passenger of a taxi stopped in the middle of the road threw the door open in her path. The crash occurred at around 10:30 a.m. on a warm and sunny Saturday. The impact was heavy enough to crack the steel of her bicycle's frame. She was sent hurling to the ground and was left, according to one witness, screaming in pain. The crash occurring directly across the street from a firehouse, the cyclist was quickly whisked away to Resurrection St. Mary's Medical Center for treatment. My law firm has been retained to represent the bicyclist. The driver of the taxi, by stopping in the middle of the road to discharge a passenger into a clearly marked bike lane, violated good sense and City of Chicago Public Chauffeurs Rule 5.18 which requires that taxi drivers, "when discharging passengers, shall do so in a safe and legal manner. . . [and] shall discharge passengers curbside." Felony charges have been filed against a Chicago police officer for striking a bicyclist with his pick-up truck on August 3rd then fleeing the scene, according to The Chicago Tribune. The officer was off-duty at the time of the crash, reports The Chicago Sun-Times. The bicyclist suffered serious injuries to her head and lower extremities. The incident occurred at around 3:25 a.m. near the intersection of California and Wabansia in Humboldt Park. The officer, Michael Bergeson, a nine year veteran, was allegedly driving his Ford F150 when he struck the female cyclist who was riding with her boyfriend. The impact reportedly sent the woman over the hood of the vehicle then onto the street. The Sun Times reports that she was bleeding from the head and was in and out of consciousness at the scene. Mr. Bergeson allegedly called 911 then fled the scene as the ambulance approached, striking two parked cars as he did so, according to The Tribune. His vehicle's license plate was retrieved at the scene. Two days after the crash, he allegedly made a false traffic report blaming the bicyclist for causing the crash. Prosecutors from the Illinois States Attorneys Office have filed charges against the officer for leaving the scene of an accident and for disorderly conduct stemming from filing a false report, according to The Tribune. Both charges are felonies. Today bail was set at $25,000. Mr. Bergeson will appear in court again on December 20th. You are riding your bicycle at night and get hit by a negligent driver suffering injuries. Your bicycle had no lights and no reflectors in violation of the Illinois vehicle code. Will you you be barred from receiving compensation from the offending driver? Every bicycle when in use at nighttime shall be equipped with a lamp on the front which shall emit a white light visible from a distance of at least 500 feet to the front and with a red reflector on the rear of a type approved by the Department which shall be visible from all distances from 100 feet to 600 feet to the rear when directly in front of lawful lower beams of headlamps on a motor vehicle. A lamp emitting a red light visible from a distance of 500 feet to the rear may be used in addition to the red reflector. However, lack of bicycle illumination will not always bar an injured bicyclist from recovering against a negligent driver for their injuries. To recover compensation in a personal injury case the injured person, aka, "the plaintiff", must prove that the defendant (1) owed them a duty of care, (2) breached that duty and as a result (2) caused (4) an injury. For example, Illinois law states that all drivers owe a duty to all other roadway users to stop at stop signs. If a driver blows a stop sign and crashes into another driver causing injury then the offending motorist will be found guilty of negligence and ordered to compensate the other driver for their injuries. But, in our state a jury asked to decide a personal injury case may consider the plaintiff's conduct as well. Sure, the defendant may have been negligent but the plaintiff may have been as well. The world is messy and complex that way. It is not always the case that person A was wrong and person B was right. Person A and person B may have both been wrong but one was more wrong than the other. In considering a plaintiff's "contributory negligence" an Illinois jury must, as with the defendant, determine whether he or she violated a duty imposed by law and whether that breach caused, or at least contributed to cause, his or her own injuries. In the simple hypothetical scenario I presented above, the injured driver also had a duty to stop at all stop signs. If both drivers blew their respective signs the injured party may have his or her monetary compensation reduced or barred altogether if he or she contributed to cause the injury inducing crash. Jurors are generally the ones charged with determining percentages of fault. Back to the issue of bicycle lighting. It is important to emphasize that a defendant, to establish the plaintiff bicyclist's contributory negligence, must prove two things: First, that he or she violated a duty either imposed by statute, e.g. the stop sign law, or by the general requirement imposed by "common law" (judge made case law) that all people act as a reasonably prudent person would under similar circumstances. Secondly, that the failure to do so was a proximate cause of his or her injuries. A bicyclist riding through the streets of Chicago without a white front headlight and red rear reflector has violated a duty imposed by state statute. However, whether that failure is a cause of a particular crash and resulting injuries will very much depend on the circumstances. I have faced this issue several times in my bicycle law practice. In my experience, whether the plaintiff bicyclist's lack of illumination proximately caused a nighttime collision with a motor vehicle becomes controversial when the driver hits the cyclist from the side in a well lit area. I have successfully argued a number of times that in that circumstance the cyclist's violation of the light/reflector law had nothing to do with the crash. If the bicyclist was hit from the side, then a front facing light and rear reflector would not have helped the driver see him or her from the side much better. Also, if the location of the crash was very well lit, then even lacking the required equipment the driver still should have seen the bicyclist. Lack of bikes lights did not cause the crash. There is support in Illinois case law for the notion that an injured bicyclist's violation of a statute need not bar her recovery against a negligent motorist. Though not a bike lighting case, the First District Appellate Court (Chicago is in the First District) considered this issue in Savage v. Martin, 256 Ill.App.3d 272 (1st Dist. 1993). That case arose from a car versus bicycle crash occurring at 103rd and California in Chicago. The bicyclist, a 10 year old girl, was struck by a westbound vehicle on 103rd near its intersection with California as she attempted to ride from south to north across the east-west roadway. The impact occurred in one of the westbound lanes of 103rd. There was conflicting testimony as to what color the light controlling westbound traffic was when the girl rode into the westbound lane. However, there was no issue that when the girl started across the eastbound lanes of traffic on 103rd the light controlling eastbound traffic was yellow. The girl was in clear violation of the vehicle code when she crossed the eastbound lanes. Based upon that the trial court found that she was contributorily negligent as a matter of law. The appellate court reversed that ruling, however, finding that crossing the eastbound lanes on a yellow light was not as a matter of law a proximate cause of the crash that occurred in the westbound lane. The Court stated that, "A jury could conclude that by the time plaintiff crossed over the eastbound lanes of 103rd and the median and reached the westbound lanes, the signal for westbound traffic had turned red. Thus, her act of riding in front of eastbound traffic when the light was yellow may have been negligent, but not a proximate cause of her being struck by a westbound vehicle." 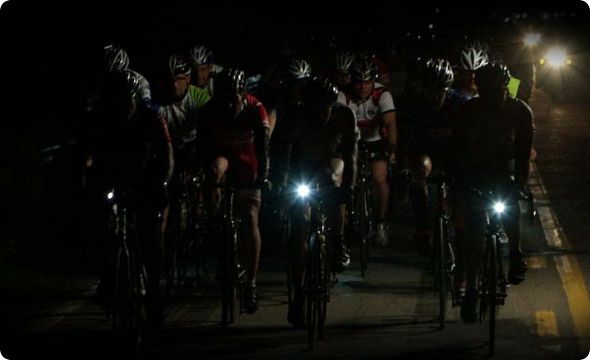 Riding a bicycle at night without lights is dumb 100% of the time. However, the legal effect of not doing so will very much depend upon the circumstances. A 67 year old bicyclist was killed yesterday in Crystal Lake when he was struck by the driver of a SUV on U.S. Route 14, according to The Chicago Tribune. The cyclist, Gordon McClain, was allegedly crossing the road from north to south when a 48 year old motorist in a 2012 Nissan Murano, driving east on Route 14, collided with him. The incident occurred at around 5:45 p.m. Monday near the intersection with Illinois Route 31. The busy area serves as an access way between residential neighborhoods and numerous shopping and eating destinations. Windwood Park in also located nearby. Mr. McClain was dead at the scene due to severe head injuries, according to The Tribune. He had not been wearing a helmet. Illinois law does not require bicyclists to wear helmets. The driver of the SUV said that he entered the intersection traveling east on a green light when the westbound bicyclist abruptly turned left smack into the side of his vehicle. Hard luck for the badly injured cyclist. . . If only the driver's story were true. The motorist did not count on the unbiased account of an eyewitness to undermine his story. A female wedding events planner was stopped on her bicycle facing south on Humboldt Boulevard at the light controlling the intersection with West Cortland Street in Logan Square when she saw the horrible event unfold. It was about 10:30 p.m. on July 8, 2012 and she was riding home from a wedding she had been working. She saw a 31 year old male bicyclist riding at a moderate pace west on Cortland as she waited for the light to turn. She remembered thinking how much she liked his red bicycle a second before she noticed bright headlights speeding northbound into the intersection, blowing the red light. The collision was massive and threw the male bicyclist's 6'2", 200 lb. frame into the air then down onto the truck's windshield, shattering it. Sparks flew into the air from the metal bike scrapping the road, making the event look like an explosion. Covered in blood, and unconscious the bicyclist was rushed via ambulance to Advocate Illinois Masonic Medical Center where he was diagnosed with a brain hemorrhage. What followed was weeks of pain, and months of healing. Thanks to his youth, good health and perhaps some luck, the bicyclist made a full recovery. On Friday, November 16th my law firm, retained by the injured bicyclist, reached a fair settlement with the driver and his insurance company, thanks in no small part to a fellow cyclist who was willing to step forward and tell the truth. Following at least six reports of product failure, the U.S. Consumer Product Safety Commission and Bike Friday announced the recall of Tikit Folding Bicycles yesterday. The manufacturer, Green Gear Cycling, Inc., which does business as Bike Friday, received reports that the bike's handlebar stem broke leading to injuries. 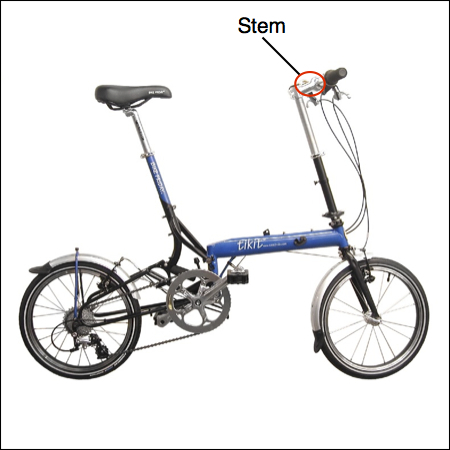 A bicycle's stem attaches the handlebars to the fork making it central to the bike's steering. Reported injuries included at least one incident of a head laceration requiring stitches, according to the press release from the Commission. 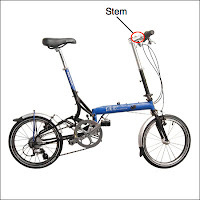 The folding bicycles, popular amount cycle commuters, were sold from 2007 until this year. If you own one of these bikes you should stop using it and contact Bike Friday to schedule a free repair. 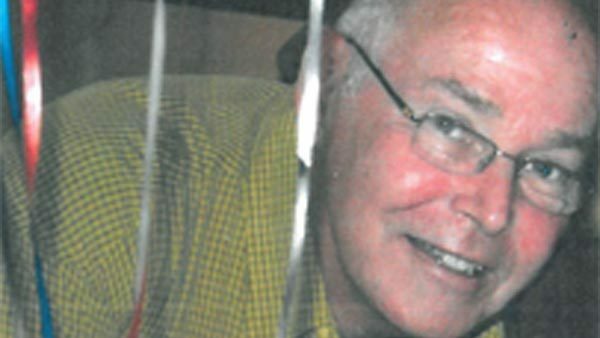 Update: 6:00 p.m.: Robert McKenney, who died after being struck by a vehicle yesterday in Skokie, was an experienced bicycle commuter who, according to his brother, rode to work whenever the weather was nice, reports The Chicago Tribune. Mr. McKenney was allegedly struck by a 30 year old motorist as he rode his bike south on Skokie Highway near Main Street. The impact caused him to flip over his handlebars and strike the road, suffering a massive head injury, according to the Tribune. It has not been reported whether Mr. McKenney was wearing a helmet at the time of the crash, though Illinois law does not require bicyclists to do so. He worked in the purchasing department at Northeastern University. A 68 year old male bicyclist was pronounced dead early this morning after being struck by a car while riding in Skokie, according to The Chicago Tribune. Robert E. McKenney was hit near the intersection of Main Street and Skokie Highway at around 8:00 p.m. on Thursday. He was a resident of Niles. No further details have been reported. His bicycle was illuminated by lights front and back and he was in close enough proximity that he probably could have shook hands with the cab driver that swerved in front of him moments before the crash. At around 1:30 a.m. on November 4th a 21 year old male cyclist was injured when the driver of a taxi cut him off seconds after the two proceeded through a north side intersection together. The incident occurred at the intersection of North Sheffield Avenue and West Wolfram Street. Moments before the crash, the two stopped next to each other, the bike to the right of the cab, at a stop sign controlling south bound traffic on Sheffield. The bicyclist was working for a pizza shop and was coming from a nearby delivery. They proceeded from the stop at about the same time before the taxi pulled ahead. Suddenly, without signaling, the driver swerved to the right directly into the cyclist's path causing the crash. He did not appear to be picking up or dropping off a fare. The bicyclist tried to stop and turn to blunt the impact but was unsuccessful given the short distance between them. The bicyclist hit the ground, his hands and knees accepting the brunt of the impact. In pain, his adrenalin flowing and immedaitely worried about the cost of medical treatment, the cyclist differed medical treatment until later that day. At Advocate Illinois Medical Center his right hand and wrist was placed in a stiff splint and wrapped in bandages. Though not fractured, his hand and wrist remain swollen and painful. His injuries continue to keep him off of his bike, his bread and butter. A fractured arm and broken teeth was the price paid by an Evanston bicyclist for one driver's inattention on Sheridan Road last week. On November 1st a 55 year old cyclist riding along the right side of Sheridan Road in Wilmette was struck by a left turning elderly driver who was not paying attention. The incident occurred at the uncontrolled intersection of Sheridan and Forest Avenue at around 8:45 a.m. The experienced male cyclist, out for a training ride on his road bike, was traveling north when the 81 year old driver of a 2003 BMW turned left directly into his path. The cyclist grabbed his brakes and tried to swerve but had little time to react and crashed into the side of the car. The impact threw him off the bike and onto the tarmac where his forearm fractured and four front teeth shattered. His 2011 Cervelo RS was also badly damaged. The man was taken from the scene via ambulance to Evanston Hospital where his serious injuries were assessed and treated. He is expected to require surgery to mend his badly fractured forearm. He is also expected to have extensive dental work over a period of many months to fix and replace his teeth. 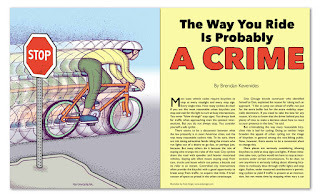 The article below appears in the November issue of Urban Velo. Idaho's "stop as yield" law has been around for 30 years. Until recently its approach to the vehicle code has failed to catch on. When I have brought up the Idaho stop law to bicycling advocates in Chicago the response I typically get is, "Well, this ain't Idaho." Fair enough. But changing the vehicle code to allow city cyclists to treat stop signs as yield signs still makes sense and, as I discuss below, is an approach that is taking hold. Oregon bicycle lawyer Bob Mionske's website has a very interesting description of how the Idaho law came to be. Check it out here. Most state vehicle codes require bicyclists to stop at every stoplight and every stop sign. Every single time. How many cyclists do that? If you are like most reasonable urban bicyclists you stop and wait for the light to turn at busy intersections. You never “blow through” stop signs. You always look for traffic when approaching even the quietest intersections. But you do not always stop. 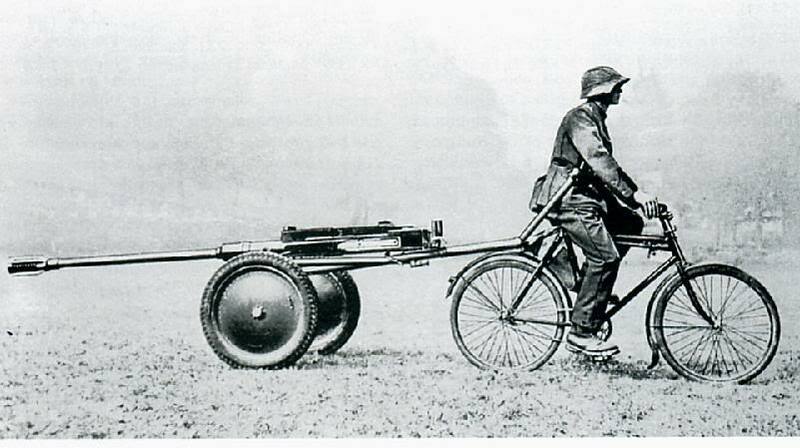 You consider yourself a safe cyclist. There seems to be a disconnect between what the law presently is in most American cities, and the way many reasonable cyclists ride. To be sure, there are risk taking adrenaline fiends riding the streets who run lights out of a desire to go fast, or perhaps just, because. But many others do it because the rule of staying alive trumps the rules of the road. City cyclists share the road with speedier and heavier motorized vehicles. Staying safe often means staying away from cars, trucks and buses which can poleax a bicycle and its rider in an instant. Controlled city intersections often provide the bicyclist with a good opportunity to break away from traffic, to acquire that little, if brief, cocoon of space so prized in the urban streetscape. One Chicago bicycle commuter who identified himself as Dan, explained his reason for taking such an approach. “I like to jump out ahead of traffic not just for the extra buffer but for the extra visibility, especially downtown. If you need to take the lane for any reason, it’s nice to know that the driver behind you has plenty of time to make a decision about how to react to your presence in the lane,” he said. But criminalizing the way many reasonable bicyclists ride is bad for cycling. Doing so neither helps broaden the appeal of urban cycling nor the image of bicyclists in general among the non-biking public. Now, however, there seems to be a movement afoot to change this. More places are seriously considering allowing bicyclists to yield at stop signs and lights. If these initiatives take root, cyclists would not have to stop at intersections under certain circumstances. To be clear, no one anywhere is seriously talking about allowing bicyclists to recklessly blow through traffic lights and stop signs. Rather, under measured consideration is permitting cyclists to yield if traffic is present at an intersection, but not waste time by stopping when nary a caris in sight. These proposals have been enacted to some degree, or are under serious consideration, in London, several cities in France, in Virginia and in Arizona. In London, under consideration at some 500 or so intersections is the possibility of giving bicyclists an “early start,” according to The Guardian. Each intersection or junction is to be separately assessed by Transport for London (equivalent to the DOT) to determine if permitting an early start makes sense given the existing conditions and risks to bicyclists. The plan could “include the installation of traffic lights set with an ‘early start’ phase for cyclists, allowing them to move ahead of the mass of motor traffic.” In June, the city’s first bicycles only traffic light was installed in one East End neighborhood. In France, permitting cyclists to treat lights and stop lights as yield indicators is under consideration, according The Telegraph. The relaxed rule is being tested at 15 intersections in Paris and at locations in the cities of Bordeaux, Strasbourg and Nantes. The law requires that “cyclists yield to pedestrians and opposing traffic,” and bicyclists will, of course, need to rely on their own self-preservation instincts to avoid calamity with motor vehicles. So far, “these experiments have led to no rise in the number of accidents,” The Telegraph quoted Paris’ town hall as stating. Recently, Illinois’ legislature has demonstrated an understanding that traffic laws may require revision to reflect sensible human tendencies. Earlier this year, a new Illinois law went into effect that permits bicyclists outside of Chicago to pass through red light controlled intersections where the light fails to detect their presence and when no other vehicles are present. While obviously not as far reaching as the other initiatives described above, this sort of law is an important step because it recognizes that it sometimes does not make sense to treat bikes just like cars. Safety should not require a bicyclist to wait for a light to change when good sense and the circumstances permit safe passage through an intersection. 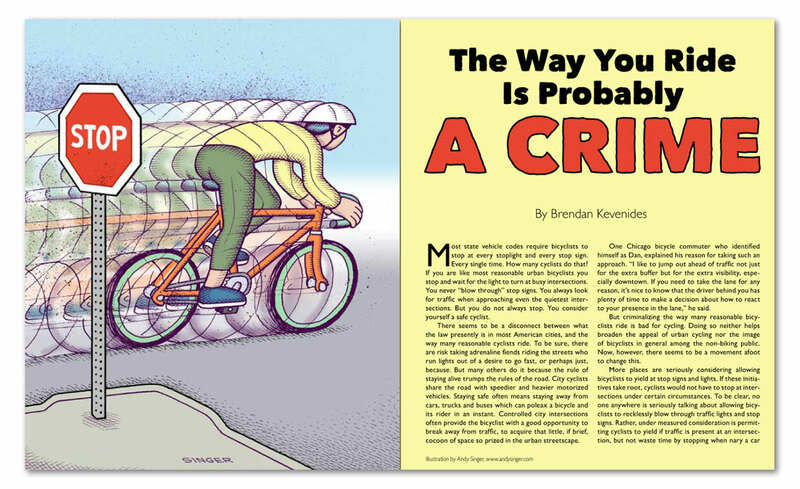 At the moment many state traffic laws criminalize the way sensible, careful bicyclists ride. This sends a terrible message and gives fringe anti-bicyclists something to scream about every time a cyclist rides through a light. Cyclists should not be legally permitted to blast through stop signs, but let us consider where it might make sense to revise the rules of the road. A right turning driver struck and killed a bicyclist this morning in Chicago's Noble Square neighborhood, reports The Chicago Tribune. This is the second time this month that a motorist has killed a cyclist in the City. This morning's death occurred at around 10 a.m. at the intersection of Ashland Avenue and Augusta Boulevard. Truck driver, Danny Darling, and a male cyclist in his 50s were both traveling westbound on Augusta when they crashed as Mr. Darling allegedly attempted to make a right turn onto Ashland, according to the Tribune. Chicago police ticketed the driver for making an improper right turn. The cyclist, whose name has not yet been released, was pronounced dead about a half an hour after the crash. 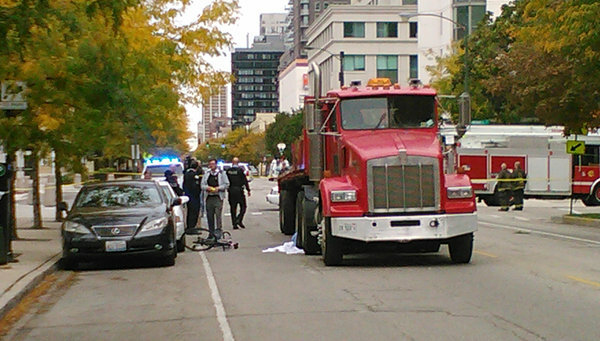 On October 5th a Chicago bicyclist was killed by a truck on North Wells Street after swerving to avoid a car door opened suddenly into his path. There was a moment a shear terror just before being launched into the air by the front end of a Plymouth minivan. Fear was swept away by pain, and the loud crunch of his helmet breaking against the hard ground. Confusion flooded in. What the hell just happened? At around 8:30 a.m. on October 24th, a 33 year old lab technician was riding his bicycle to work on Lincoln Avenue in Skokie when he was hit by the front end of a 1999 Plymouth Voyager minivan. The crash occurred mid-block, near 7501 North Lincoln, in front of Sigler's Auto Center. The minivan driver had shot across four lanes of traffic, attempting to go from the driveway of an apartment complex into the parking lot of Sigler's, when he smashed into the left side of the cyclist, pedaling northbound in the curbside lane. The impact threw him high into the air before planting him on his head and shoulder on the sidewalk that had been on his right. He was transported from the scene via ambulance to Skokie Hospital. The driver admitted that he failed to see the cyclist before attempting his maneuver and was ticketed by police at the scene. My law firm is representing the injured cyclist. The driver of an SUV, who claimed that the rising sun prevented him from seeing a bicyclist, has agreed to resolution of a claim brought by my law firm on the cyclist's behalf. The settlement will compensate the bicyclist for his injuries and enable him to have his custom bicycle rebuilt. At around 6:30 a.m. on August 7th the male bicyclist was riding west bound on Howard Street on his way to work. The driver was traveling east bound on the same road when they both entered the intersection with Dodge Avenue in Evanston. The cyclist should have been easily seen by the driver as they both traveled through the middle of the intersection. However, the driver of the 2004 Chevy Blazer claims that the morning sun partially blinded him as he began to turn left onto north bound Dodge. When he did he crashed hard into the left side of the bicyclist. The impact was so heavy that the rider's left hip left an imprint in the middle of the SUV's front grill. Unable to walk following the crash, the cyclist was taken to Resurrection St. Francis Hospital later than morning. The weight of the impact also demolished the man's brand new, custom built Rivendell bicycle, just over a week old. The bike has been assessed as a total loss, it's steel frame and many of its components badly damaged. As the bicyclist lay in the street he looked down at his limb and saw a huge bloody curtain of skin and muscle drawn back revealing the two large bones of his lower right leg. It seemed as if a shaky surgeon cut a large slab from the side of his leg below the knee. The instrument of this carnage, however, was a car door. After extensive treatment, the bicyclist retains an ugly scar on his lower leg and suffers from numbness that radiates into his right foot. He has recovered full use of the leg, however. Chicago cyclists gathered under a gray, somber sky this morning in Old Town to honor and remember Neill Townsend, a bicyclist killed on North Wells Street two weeks ago. Several members of Neill's family, his friends and many others that never knew him stood in silence in a light drizzle to gaze at a ghost bike placed at the site in his memory. Speakers at the the memorial appealed to those in attendance, and, via members of the media, to the many thousands not in attendance, to never allow deaths like Neill's happen again. He was killed riding to work in the dedicated bicycle lane near Wells and West Oak Street when a semi tractor trailer ran him down after Neill swerved to avoid a car door carelessly opened into his path by a motorist parked along the curb. Bicycles are fun, healthy and environmentally neutral. They are also cheap transportation, particularly in the city where relatively short distances make the use of bicycles to run errands, get to work and drop off the kids very doable. More often these days it seems that lots of people are forgoing the considerable costs of car ownership and using their bikes, along with public transportation and their own feet, to get around. Great. But, one risk that comes with not owning a car is not having car insurance. If you are injured by a motorist while riding your bike your own auto insurance may provide you with some important protection. It may protect you if the driver either lacks insurance or has insufficient insurance coverage. If you do not have health insurance, the medical payment provision of your auto policy may help cover your treatment costs. Without auto insurance, the bicyclist is more vulnerable to financial calamity should he or she require medical care after being injured by a motorist. Increasingly, however, there are options out there for the non car owning bicyclist. One option that has been around for a while is non-owners car insurance. I have written about that before and I recommend looking into it. Recently, I became aware of another option available to Illinois cyclists: Bicycle insurance. This year one insurance company, Markel American, began offering these policies to cyclists in our state. The company's website offers the means to get a detailed insurance quote. Curious, I investigated. What I found was that for $310 a year, $25.83 a month, I could receive $25,000 in "bicycle liability" and "vehicle contact protection." Markel defines bicycle liability coverage as "protection for bodily injury or property damage" for which the insured cyclist becomes liable to another person such as a pedestrian, another bicyclist, or motorist. Vehicle contact protection is coverage to benefit the bicyclist should he or she be injured by an uninsured or underinsured driver. That $310 price also includes $10,000 in medical payments coverage defined by Markel as coverage providing "protection for the reasonable charges for necessary medical, surgical, x-ray, dental, ambulance, hospital and professional nursing services and funeral service expenses incurred within one year form the date of an accident causing bodily injury to an insured while using an insured bicycle." Generally, the insured may receive compensation under a medical payments provision of an insurance policy regardless of who was at fault for causing his or her injuries. The quote I received also provided some nice benefits should the insured bicycle become damaged in a crash. What Markel is offering sounds good. However, whether it really is good will of course depend upon how it works in action. Will the company honor its promise to a bicyclist that purchases one of its bicycle insurance policies? I really do not know anything about Markel nor, to the best of my recollection, have I dealt with them on any claim or case I have worked on over the past 16 or so years. Please do not accept anything I have written here as an endorsement of Markel or any service or policy it provides. I encourage readers to investigate for themselves whether purchasing one of its bicycle insurance policies makes sense for them. I invite anyone who does purchase a policy to comment on this blog about their experience, whether good or bad. 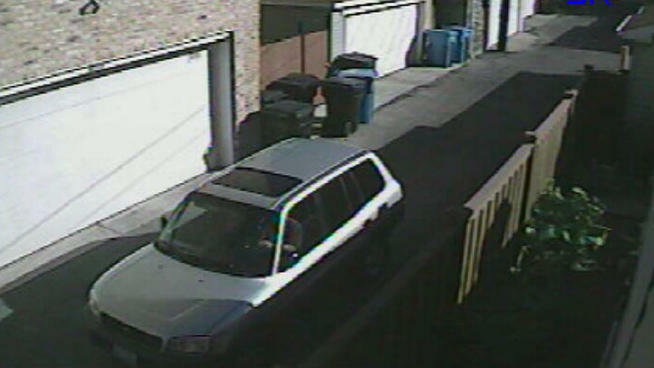 Chicago police are looking for the driver of the vehicle pictured below who allegedly struck and seriously injured a bicyclist before fleeing the scene on September 24th, according to NBCChicago.com. The incident occurred at around 4:00 p.m. in the 4100 block of West School Street. The impact reportedly threw the 52 year old cyclist up onto the windshield of the vehicle. The bicyclist was in critical condition after the collision though no updates on his present condition have been reported. Soon after I posted about this event on September 25th an Anonymous person left a comment on this blog that the cyclist had "apparently died." I have been unable to confirm that. The CPD believes that the vehicle is a silver Toyota RAV4, of 1998-2000 vintage. "The driver is described as a male Hispanic about 29-30 years old standing about 5-foot-9 to 5-foot-19 with a forearm tattoo wearing a black or gray graphic T-shirt," according to NBCChicago.com. If you have any information please contact the CPD at 312.745.4521.